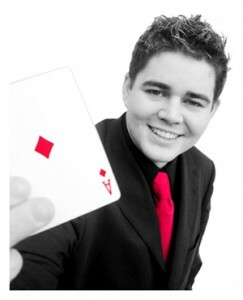 Woody Close-up Magician is one of the most highly rated magicians and entertainers in Scotland. He combines mesmerising sleight of hand illusions with his unique Glasgow patter to break the ice at corporate events, weddings and parties. His wedding magic act is great for breaking the ice and giving your wedding that unforgettable edge. He is equally at ease with Children and will shape balloons and magic for the kids. H is the complete all rounder and is the ideal entertainment for magic at corporate entertainment, trade shows and parties where he can provide a unique experience for your guests. Woody also does close up magic, table magic, mentalism and stand up magic in cabaret. He has worked for a host of clients venues and hotels throughout Scotland and works in Glasgow, Edinburgh , Dundee, Aberdeen and Inverness for CJ Lang Hampden Park, Arta The Corinthian, 29 Club Hilton Hotels, Hamilton Park Racecourse ,Celtic FC, Thistle Hotels, Double Tree By Hilton, Crowne Plaza , Gleneagles , Turnberry Cameron House, Radisson, Marriott, Sheraton Jury’s and MacDonald Hotels.